Ortolana means "market gardener" in Italian, which is apt as this restaurant in Britomart always offers a good selection of vegetables from their own farm. It has an inclusive menu in that they cater effortlessly for vegetarians, but can also be daunting in that you might need to ask the staff to actually explain the words on the page. Beautiful decor and high ceilings at Ortolana. I thought I was a bit of a sophisticated foodie already. I've eaten cavalo nero and quinoa (though I have a complex about pricing native peoples out of their own grains). I knew the meaning of aioli years ago, before BurgerFuel started serving it with their chips. I've tried making my own paneer and labneh is on my to-do list. But every time I go to eat at Ortolana, I have to check on the meanings of a more than a couple of words. How many of the following terms do you know? If you eat out at high-end restaurants a lot, you may be acquainted with some of them already, but I'd be surprised if you understood them all. I mean, really, nduja? I had no idea that Italians even made that sound combination. And painisess, which was on the menu in April, was not a word that Google knew about at all! How many of those did you get? I would have guessed that lasagnotte is similar to lasagne, but it is actually a narrower ribbon pasta that is ruffled on one edge. I've eaten burrata enough times now to be familiar with this creamy fresh cheese, but did I really equate it with mozzarella stuffed with stracciatella? I correctly supposed that crema fritta meant "fried cream", but what came out wasn't how I expected it at all! We keep returning to Ortolana, not for the linguistic challenge, but because it has lots of things going for it: a central location close to the Britomart train station, a pleasant atmosphere with polished service, and above all, delicious food at reasonable prices. The portions are on the smaller side, so you have an excuse for some excellent dessert. Oh, and there's unlimited free sparkling water—bonus! 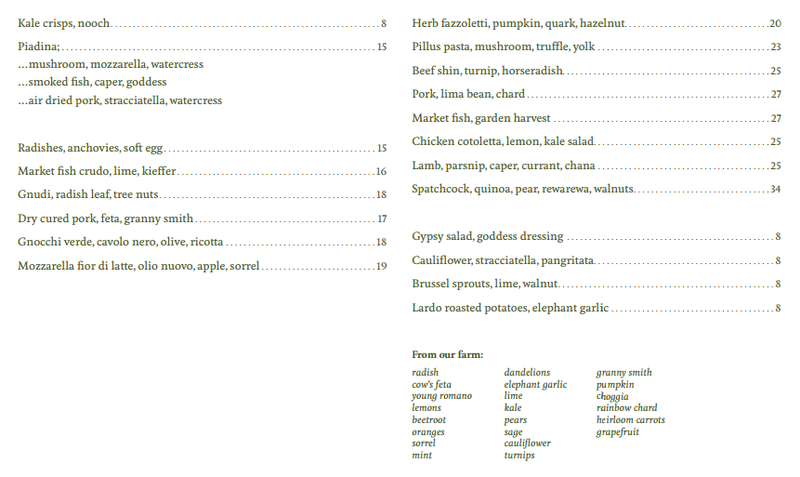 As if you might forget the meaning of the restaurant name, practically every dish is strewn with micro-greens. Not that I am complaining—I always like to have some vegies with my food. Kingfish carpaccio and chicken cotoletta with plenty of greens. The piadina is a constant fixture on the menu, and can be eaten for lunch or dinner with a variety of fillings. This thin Italian flatbread is a great option for a light meal. As the menu changes depending on what is in season, not everything is guaranteed to be available. A few weeks ago, we were told that the chestnuts in a dish would be replaced by walnuts, and the jerusalem artichoke and hazelnut soup that I enjoyed last year is not offered at all right now. Jerusalem artichoke and hazelnut soup, back from April last year. It's not all about vegies at Ortolana. Their cheeses are beautiful, whether you order a fresh cheese as a main or entree, or savour a washed rind one with honey as part of your dessert. Mozzarella fior di latte, olio nuovo, apple, sorrel. The pastas are skilfully cooked, and come in a variety of different shapes, as you can tell from the list of foreign words above. You can choose from a range of great meat dishes too, from fish to chicken to red meat. Most recently, they had the very gourmet-sounding "spatchcock" on the menu, served with quinoa, pear, rewarewa and walnuts, though no one at my table ordered it. Rib eye bistecca, fried green tomatoes, oregano relish. Pretty much everything we have ordered has been spot-on (though we didn't care for the kale crisps with nutritional yeast), but don't forget to save room for dessert as these are amazing too. 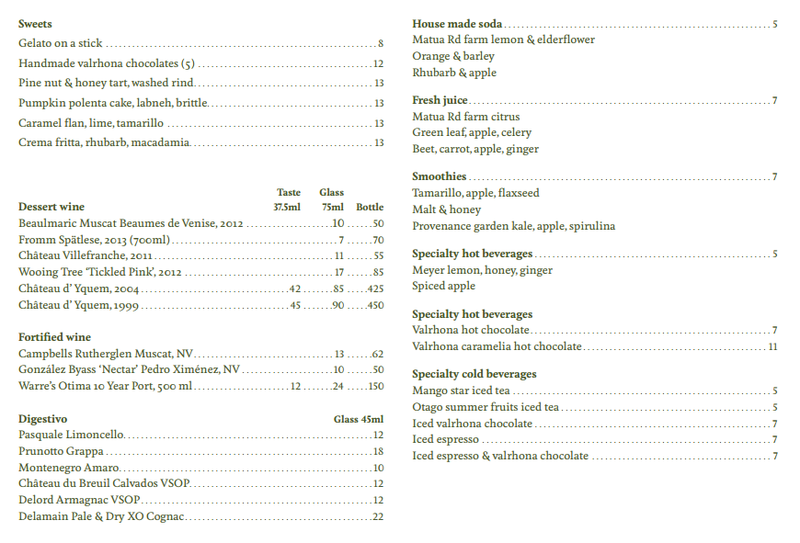 A few months ago, they let people order anything from dessert-only restaurant Milse next door (yet another inspiring eatery from The Hip Group). That proved to be problematic, however, so you only get to pick from a cut-down list of choices again. You can, of course, add yourself to the queue at Milse if you want the full experience. The menu changes regularly, so make sure you talk to the staff to find out what the specials are, and to get a better idea of how things are served. Drinks: There is an unusually large selection of non-alcoholic drinks. Their hot spiced apple drink ($5) was particularly apt for a cold winter's day, and we have enjoyed their refreshing sodas and other drinks too. You generally have a couple of entrees ($18-$19) and pastas ($20-$23) to choose from, and if you are not very hungry, the piadinas ($15) are great too. The potatoes are cooked with lardo and therefore not vegetarian, but the cheese options will be quite filling. This restaurant does not take bookings. Turn up early and leave your name and number, until a table is free. I know spatchcock and rillette from that list and I consider myself a foodie. 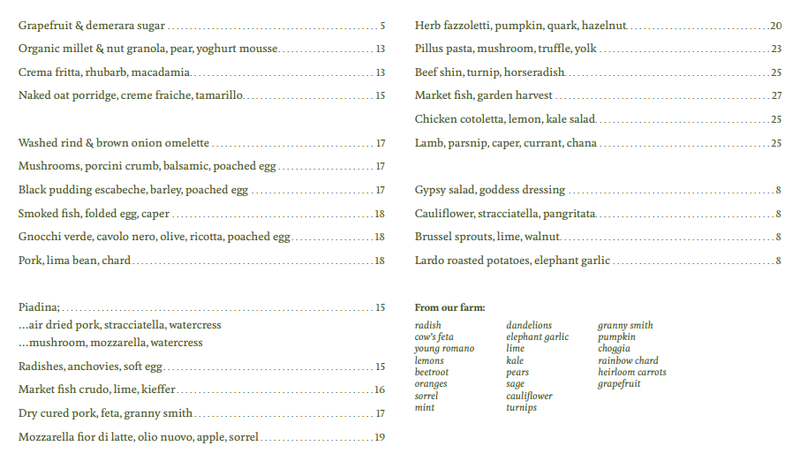 I feel that if most of your menu are words that your do not understand, you're being overly pretentious. I've been to Ortolana and I enjoyed it, though I must have a hearty appetite because I was still hungry after my meal! I have to say that the word "pretentious" did come to mind when I was describing this restaurant, not just because of the vocab in the menu, but also because of the liberal use of micro-greens and sparkling water (though I like these touches now). It's not a big deal if you don't know what shape your pasta will appear in, but the crudo part of "market fish crudo" is pretty important information that someone could miss. Now that I have learnt more words, the menu does not seem quite so scary. I agree the portion sizes are small and you might want to order a side of potatoes or an extra entree or something. In general, I prefer restaurants to serve smaller portions for lower prices though, because then you have room to try more dishes. It also means I don't mind going to the place when I am not particularly hungry. Actually, that's a good point. It is nice to be able to try more than one dish. I'd have been better enticed towards visiting Ortolana if their dish presentation was more organized, but it appears they are deliberately going for a completely informal feel. You did a good job of conveying what they have to offer. Thanks - you're right, it is supposed to be classy-but-casual, a style of eating I am liking more and more, mostly because I don't plan enough in advance to get into some of those fine dining restaurants! And the price tag is comparatively more attractive too, of course.